says it all when it comes to STUR-D bale feeders. 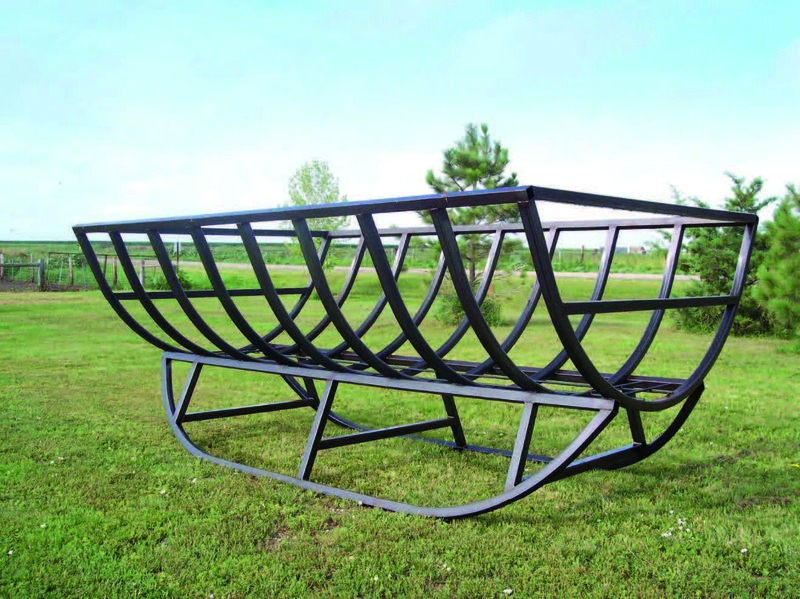 The one-piece welded construction provides for many years of maintenance-free feeding. 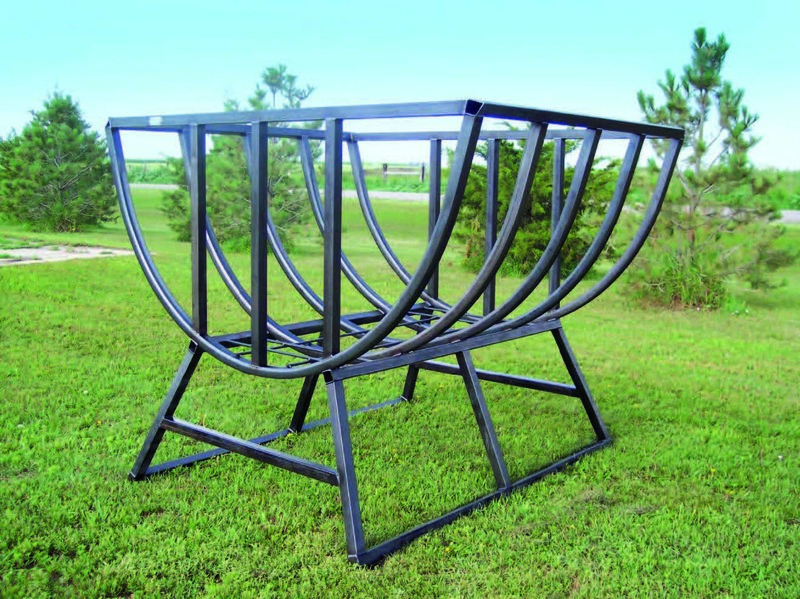 Constructed of 2 3/8″, 7-gauge pipe with 20″ of 15-gauge skirting and 1″ sucker rod slant bars, STUR-D bale feeders are the heaviest around. We also have a wide variety of styles and sizes to meet all your feeding needs. 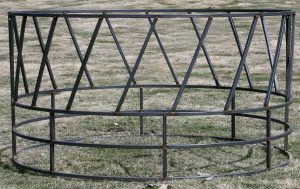 This bale feeder, which holds the hay up off the ground, was such a hit they went through the time and trouble, about two years, to get it patented. The distinctive design allows calves to eat from the bottom of the feeder rather than being unable to reach the hay or even getting caught in the middle of a traditional feeder. 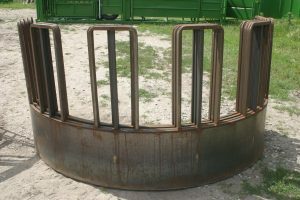 The unique curved bale saddle stops larger animals from stepping on hay dropped below the feeder, but allows smaller animals to get under the feeder far enough to reach the center of the bale. The single hay bale feeder is taller to prevent horses from rubbing their mane. 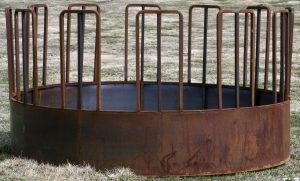 The unique curved bale saddle stops larger animals from stepping on hay dropped below the feeder, but allows smaller animals to get under the feeder far enough to reach the center of the bale. 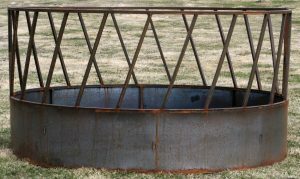 use bolts to connect the halves or weld them together, as the bale feeders come in two piece units. • Regular/Un-Skirted – Weight 185 lbs. • Skirted with 18″ of 16 ga. sheet — Weight 230 lbs. • 16 ga. skirting – Weight 260 lbs. 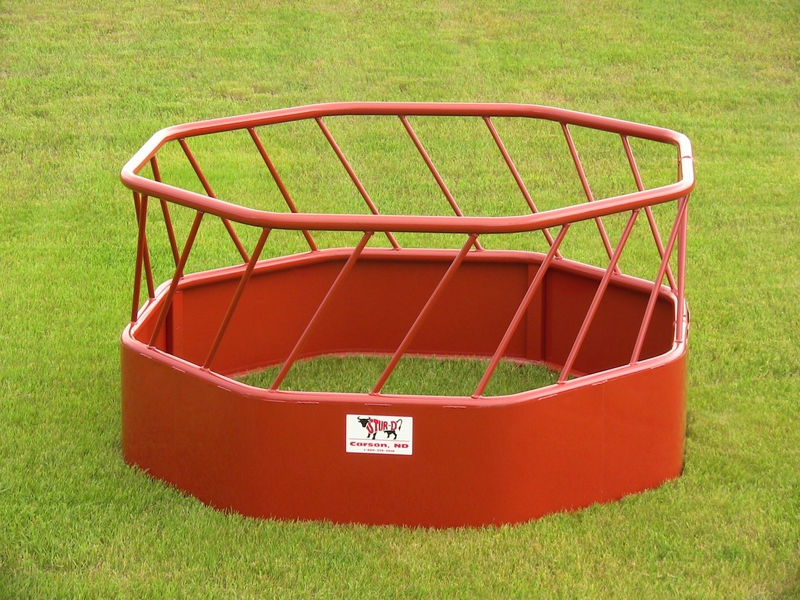 The regular bale feeders come with a 5 year guarantee against animal damage.